One of the important sightseeing attractions in Binsar and a unique place for meditation and picnic. Nestled on one side of the Kumaon range, Binsar is an idyllic hamlet for those who is looking quite and calm holiday with natural beauty. There are many temples around Binsar and among them, the most famous is Bineshwar Mahadev Temple. The manifestation of Shiva worshipped in the temple was called Bineshwar, a name which the British later corrupted to Binsar. It is a unique place for meditation and picnic. Bineswar Temple or Binsar Mahadev Temple is situated at a distance of 19 kms from Ranikhet district of Uttarakhand State. Built in 10th century, the temple is known for its fine architecture. The temple was built by King Pithu in memory of his father Bindu, hence this temple is also known as Bindeshwar temple. Located at an elevation of 2480 meters above ocean level, its surroundings compresses with natural fresh water springs and thick deodar forests giving the visitor an experience of peace and serenity. The temple also has a ashram nearby, dedicated to Binsar Mahadev. According to the legend of the temple, it was built in a single day. Women come here on the day of Vaikunth chaturdashi and it is belevied that desire of a child is fulfill here if they pray all night with lamps in their hands. The temple also has ashram nearby, dedicated to Binsar Mahadev. Eventhough the temple is dedicated to Lord Shiva, it houses the idol of Lord Ganesha, Goddess Har Gauri and Goddess Maheshmardini . The idol of Maheshmardini is engraved with texts in Nagarilipi which dates back to as early as the 9th century. 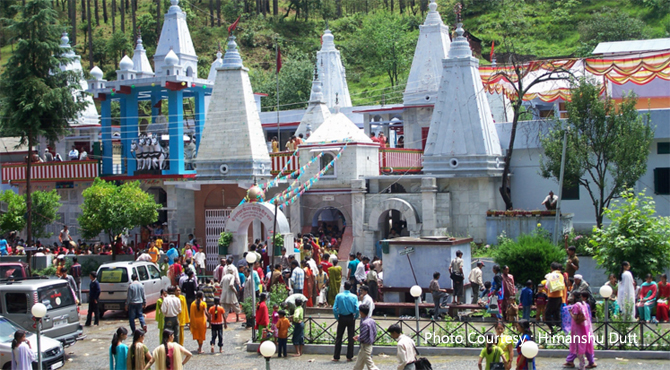 Every year on Vaikunth Chaturdashi and Kartik Purnima, a two days Binsar Mela is organized at this temple which occurs in the months of June. Lots of people mainly from Pauri, Chamoli, Rudraprayag and Almora districts come in this fair. Lots of rituals and cultural programmes are followed by the locals during the occasion which includes Pandav and Chaufula dances, Mangal and Khuded songs etc. are performed. Binsar is also a trekker’s paradise. The holy place can be reached after a long trekking through dense forests of Oak, Deodar and Rhododendrons. The trek starts from Chounda, near Jagatpuri which is nearly 6km steep climb. Alternative route is via Thailisain-Peersain which is 11km. There is a small symbol on the front gate of the temple to its left which may be the writing of Vishwakarma himself. Near by tourist attraction such as Jaina Village, Ranikhet, and Jim Corbett national park, Almora and Dunagiri temple in Dwarahat, these all attraction point are approximately 80 to 100 km from Binsar Mahadev.